Dedicated to supporting emerging artists and curators and creating new opportunities through programming, screenings and exhibitions. Committed to reaching new and diverse audiences and to support artists from a broad range of cultural communities. Promote development of artists by facilitating workshops, guest lectures, artist talks, screenings and exhibitions. Forge community partnerships and collaborate with other artist-run centres, arts organizations, emerging artists and curators and community collectives and groups to enhance available resources and impact for programs on our communities. Increase the involvement of local groups, programmers, curators and artists who are from and/or work with groups that face barriers and systemic oppression due to racism, homophobia, transphobia, ableism, colonialism, sexism, islamophobia, classism, and misogyny. Continue to create new and innovative ways to involve young artists and audiences. 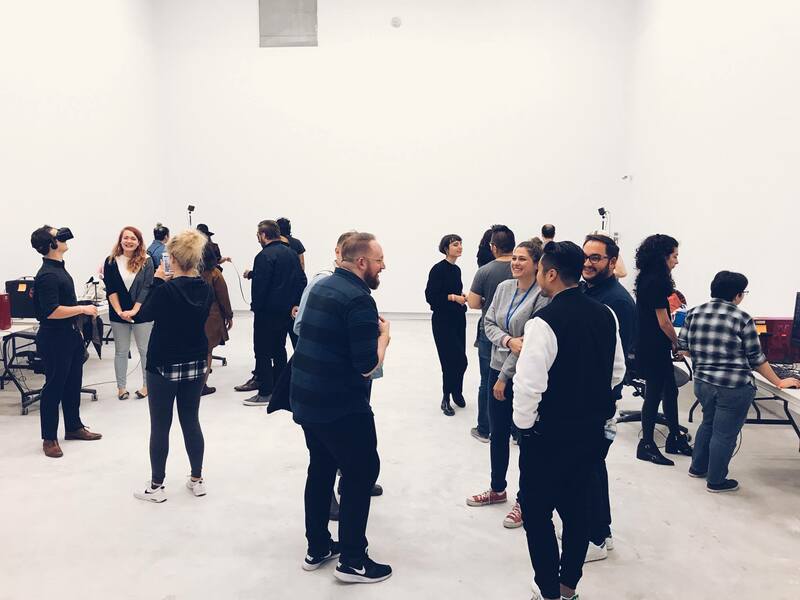 To bridge the gap within artist communities and the divide between established and emerging artists and curators and to provide resources for professional development. Interested in collaborating with the CFMDC? Contact Morgan at morgan@cfmdc.org. Focusing on feminist, queer, intergenerational and Indigenous voices, CFMDC’s public outreach will support our mandate that art is necessary for driving change at the personal and political level. By partnering with these organizations and collectives we hope to provide space to collaborate with emerging and established artists and resources for disseminating initiatives and knowledge-sharing. HOLES AND HOW TO FILL THEM is a year-long collaborative project between EMILIA-AMALIA (E-A) and the Canadian Filmmakers Distribution Centre (CFMDC) that takes the hole as its organizing principle and guiding metaphor. Designed as a test-site for feminist research, commissioning, writing and exhibition-making, HOLES AND HOW TO FILL THEM takes up E-A’s ongoing interest in practices of failure, refusal, withdrawal, deliberate omission, and generative stoppages as sites for feminist organizing and conduits for lost intergenerational knowledge. The hole is the gap left in feminist histories. It is the void left by withdrawn or failed or abandoned projects. It is the blank spaces made by striking workers. It is the vacuum of whiteness as the universal norm. The hole traces both absence and presence. The hole is the grave and the womb. It is the blindness of the unseeing eye, and mouth open wide to take it all in. Combining public lectures and workshops, commissioned performances, curated screenings and publications, the program activates the CFMDC’s collection and institutional space to explore gaps, holes, fissures, failed and abandoned projects, and the undetonated potential of the past. HOLES AND HOW TO FILL THEM is supported by the Social Sciences and Humanities Research Council of Canada and the Canada Council for the Arts. Stop Making Sense / Sense Making, a collaboration between SKETCH and CFMDC, is a 10 week workshop series for youth on the margins to interact with film, media, and technology and create works to be exhibited in August 2019. The workshops are a makerspace for those who want to explore the absurdity of our senses. The theme is underscored by experiential learning and knowledge that participants will be able to gain knowledge by doing. The workshops begin at the end of May and run until the beginning of August, with a culminating exhibition August 20th - September 1st 2019. The GLAM Collective (Galleries, Libraries, Archives and Museums) Dr. Heather Igloliorte (Concordia University and Research Chair), Dr. Carla Taunton (NSCAD University), Dr. Julie Nagam (University of Winnipeg) who are a team of Indigenous and Allied scholars and curators, who will be expanding on their previous research while simultaneously breaching new territory concerning their collective interest in digital and new media artwork. GLAM covers the area of Indigenous contemporary art practices in concert with cultural geographies, Indigenous theory, performance, film, visual art, digital and new media, cultural studies, curatorial practices, and art history. An exhibition will take place in October 2019 at the Toronto Media Arts Centre. Generously supported by the Canada Council for the Arts. Re-Joyce: Wieland For A New Millennium, Reading by Lee Maracle, April 2019. EMILIA-AMALIA x CFMDC, Jackie Wang and Nasrin Hamada in Conversation, April 2019. Brette Gabel installation as part of Re-Joyce, April 2019. Aram Han Sifuentes, Protest Banners, part of Re-Joyce, April 2019. Truth Booth by Kiera Boult, part of Re-Joyce, April 2019.